M T D J u n e 2 0 1 8 66 F o c u s o n I n d u s t r y T his past year has seen a number of changes surrounding the In- dependent Tire Dealers Group LLC (ITDG), but one thing has remained constant, and that's the continued growth of the group. Dave Marks took over the reins as CEO and president of the ITDG last August following the retirement of Michael Cox. e industry veteran has been making the rounds to accomplish his "personal goal" of meeting all 147 members with 660 locations in 43 states. At the same time, Marks has been working with the group's vendors to "make sure the programs fit and are strong for everyone." During the ITDG's annual meeting and trade show held in Chandler, Ariz., in May, Marks told the 315 attendees (people from 89 members and 52 vendors) that he remains committed to growing the group to 175 members with 750 locations in 46 states by the end of 2019. He also upped the ante by stating a five-year goal of having 225 members with 1,000 locations in all 50 states. e way Marks intends to do this is "by adding value in everything we do." Marks is quick to give credit to the ITDG staff members who are making the success happen. ITDG veterans Chris Barry, senior sales director; Cheryl Bluman, office manager; and two new hires, Sherry Bily, director of programs and pricing, and Tony Garrett, regional sales director — east, have been the guiding force behind the growth ITDG experienced this past year. ITDG added 10 shareholders this past year from across the country. 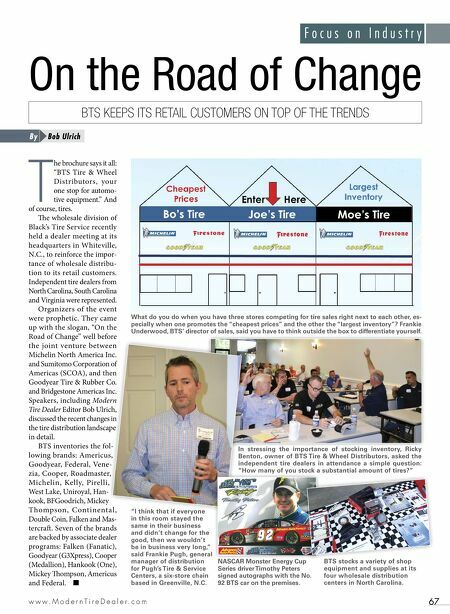 Marks refers to the ITDG as "a group of very successful, fiercely independent tire and automotive dealers, dependent on someone like us to secure the programs, pricing and vendor partnerships that will add additional value and profits to their business." e total group purchases by members for the past year was $226,628,990, a growth of 7.3% from 2016 with a total volume bonus and dividend payout to members of $8,675,740, a growth of 4.9% from 2016. During the event, members were told that shareholders of the ITDG captive insurance company earned a dividend of $1,000 per share. e dividend matches the original value of a share when the insurance com- pany was created in 2005 with 40 members. Currently, there are 25 members. Since its inception, the average annual ROI has been 20%, according to the ITDG. Marks says the state of the ITDG "could not be stronger, even in the uncertainty of the industry today. We will grow and be stronger and we will be united." During the ITDG board meeting, the group took on a new initiative called Next- Gen. It is a committee that the group has developed to make sure that the younger generation will have a bigger voice in run- ning the businesses and how they should go to market. According to Marks, the idea came from Clay Miller, former chairman of the board and current owner of Mainstreet Tire USA in Peyton, Colo. "It's important for business owners to hear what their family members have to say, 'Dad, we do this,' and then actually let them implement the ideas." During the meeting, 15 to 20 members expressed interest in participating with this initiative. e details of the ways that the committee will engage are still being developed, according to Marks. 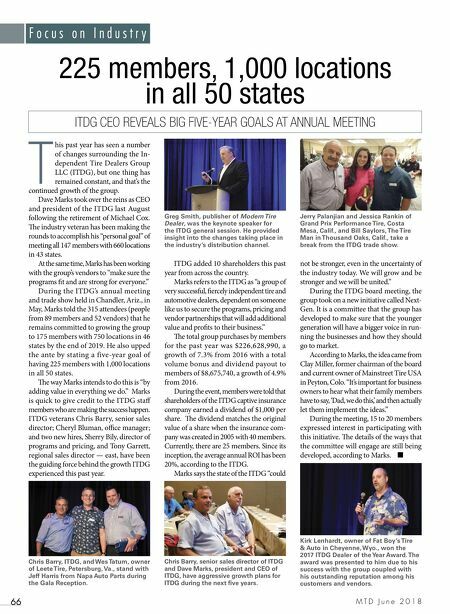 ■ 225 members, 1,000 locations in all 50 states ITDG CEO REVEALS BIG FIVE-YEAR GOALS AT ANNUAL MEETING Greg Smith, publisher of Modern Tire Dealer, was the keynote speaker for the ITDG general session. He provided insight into the changes taking place in the industry's distribution channel. Chris Barry, ITDG, and Wes Tatum, owner of Leete Tire, Petersburg, Va., stand with Jeff Harris from Napa Auto Parts during the Gala Reception. Kirk Lenhardt, owner of Fat Boy's Tire & Auto in Cheyenne, Wyo., won the 2017 ITDG Dealer of the Year Award. The award was presented to him due to his success with the group coupled with his outstanding reputation among his customers and vendors. Chris Barry, senior sales director of ITDG and Dave Marks, president and CEO of ITDG, have aggressive growth plans for ITDG during the next five years. Jerry Palanjian and Jessica Rankin of Grand Prix Performance Tire, Costa Mesa, Calif., and Bill Saylors, The Tire Man in Thousand Oaks, Calif., take a break from the ITDG trade show.